Last week may be considered the "Lost Week". I wasn't near as productive as I'd have liked because my schedule was off. I did get to spend much of the week with my grandmother and oldest niece while my mom and step-dad went on vacation. As well, I helped a friend prep for her daughter's birthday. We also agonized over what to do about my sweet Asia kitty. Her illness isn't getting any better. While steroid shots seem to make her feel better for several weeks at a time, she's still struggling to breathe and looks uncomfortable the rest of the time. We cried and prayed over what to do, but the decision is so very hard to make. For now, she's received another shot while we monitor her even closer to try to make the decision and come to terms with it. Gah! Okay, enough with all that. Here's what my desk looks like today. There's a little of everything on there once again. At the far left is my art journal, open and waiting with a blank page. Next is my bullet journal, also waiting for me to set out the day's list. Then there's the altered playing card that I'm currently working on. It's got some washi tape and gesso lines on it, but that's as far as I've gotten. If you're curious, the top of my desk includes a small trash bin (the green thing at left with the clothes pins on it. ), a glass container with various supplies (rulers, x-acto, bone folder, wooden skewers, knitting needles, etc. ), a swiveling organizer that holds my pliers and scissors, a bowl of miscellany (tape, glue sticks, lip gloss, liquid paper, and tape measures), a cup and saucer that I throw things in to keep them from getting buried), a plastic cup of water with some paintbrushes, and a nice big selection of pens and pencils (I have an office supply issue.) Also on my desk are my timers, which I set to try to make sure I get up and move around every half hour or so. You know, for my health. That's the bulk of it for today. And now, it's time to start tackling some of these tasks. Here's hope you keep happily busy today too. 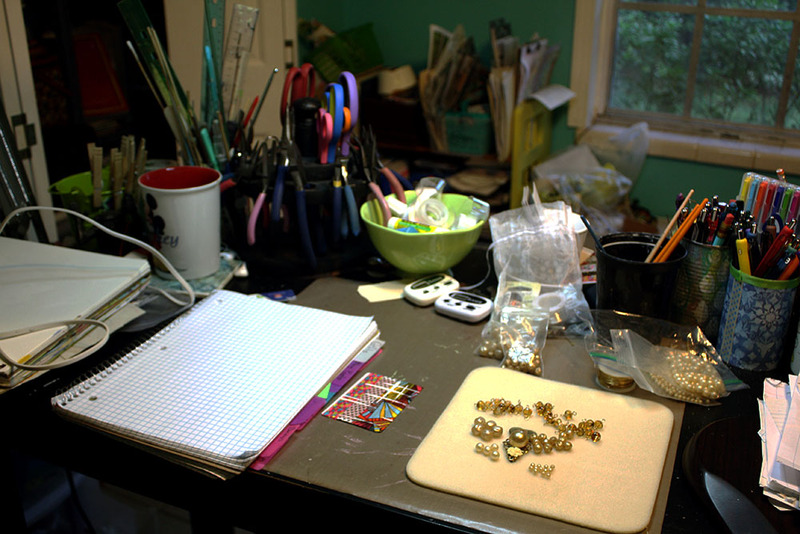 I'm linking up my desk on What's on Your Workdesk Wednesday at Stamping Ground. Come play along, or just tell me. . .what are some of the supplies on your desk that are always there? Sandy, Thanks! I can't take credit for it though. Years ago, I think I read the health tip about setting a timer to get up every half hour. Sometimes it's hard to pull myself away, but I make it work. And the trash bin - one on top and a larger one below. The upper one helps me keep from dropping little pieces of wire on the floor when I miss the big one. It only takes stepping on wire barefoot once to make that decision. Eek! Thank you for popping in! Vicky, yeah. We know what we need to do but are just having a hard time accepting it. The shots seem to help her feel better for a few weeks, so we're just trying to come to terms with it now and will face the hard truth very soon. As for the timers, I'm so prone to just get drawn into something that I can't pull myself away. The timers totally help pull me from that daze. Hi Hope, It is so hard to let our fur babies go, but you will do the right thing. Sending heaps of hugs (((Hope))). Looks like you have a busy desk just waiting for more crafting. You got some fab stash. You'll enjoy playing with it. Anne, I have to admit that I have dumped the water on an occasion or two, but I've also dumped coffee, cold water, and many other substances. I'm just klutzy like that and have simply learned to live with it. As for the beads, the necklace is finally coming together after some delays in decision-making. Just a jump ring and a clasp and I should be done! Thanks for the kind wishes and for also stopping by! Oh Angela, the baggies actually just more of the pearls for the necklace. I only got a few of each kind out until I made the decision. Now that I'm finishing up the project, it's time to get them back in the bead cabinet. Thanks so much for taking time to hop by! Hi, your work area looks very organised! You can even see desk. I can only rarely see desk surface here. Thanks for your kind comment about my card. Much appreciated. I've been trying to be better about not covering EVERYTHING up. It's hard sometimes. I'm not sure I would consider it organized though. Thanks so much for swinging by! Sorry about your cat. Hope things get better. Your desk looks very busy. Like the altered playing card. Oh, I do sympathise with the dilemma about your cat..it's a fine line between not wanting to lose them but also not wishing any more suffering on them. I've been there too. I like the way you have all your essential tools/stuff to hand on your desk...I know where all my tools are because I can't bear wasting time searching for stuff! Oh dear. What a terrible time and one which I have gone through myself. There will come a time when you make a decision for the best but only you can decide what, when and where. Thoughts and love coming out to you. In the meantime you seem to have lots of artwork waiting to be done, hope it keeps your mind off things and you can lose yourself in creativity. Neet, Thanks so much. I just have to have the time to wrap my head around what needs to be done. I'm just so worried about what IS for the best. I hate this decision SO MUCH. I appreciate your kind words though. There's always something to be done, never any time to get to it all. But, yes, creating is a great way to distract myself. Thanks so much again! I'm sorry to hear about your cat. Making these decisions are the harder ones in life. I hope she gets well. I like the looks of the playing card, would love to see it when it's done. It is so hard. I'll make the right decision, I just needed some time after being away from home for a few days. I'm so glad you like the washi and gesso. I couldn't decide what to put on top of all that awesome pattern, but gesso felt like the way to go. It only two a few more elements and that card was completed. Super easy! Very sorry indeed to hear about your poor kitty. We have 2 and know how they steal your heart... Both of ours are quite old now and both on medication and one on a special diet, so they are complicated to look after! You have some interesting stuff on your desk. Thank you for your lovely comment and I'm glad you were amused by my stoma cakes! It was a fun day. Also my Zentangles! I've done some more today but not photographed yet. We've been fortunate that this is the first big health issue she's faced. But, since the doctors and experts can't figure out what's in her lungs, we may have no other choices. Fur babies so indeed steal our hearts. As for my desk, I definitely have too many interests. Ha! My daughter has 2 bengal cats and one has cancer. It is so hard to know what to do. so far medication has helped. May yours get healthy. Lots going on your work space.Fun to have so many interests. Thanks for stopping by - it helps that I am retired. Lot's of extra me time! Oh, gosh, such a sad and difficult spot to be in. I was there recently with my Phoebe. I finally made the decision to let her go and it was the right decision. I probably kept her with me a bit too long. My best to you! Melissa, It is difficult indeed. I know we're going to have to let her go. I just needed time to prepare myself for it. Thank you so much for your understanding and kind words. I used to be organized but somehow that went to the wayside over the last couple years. And since I discovered coloring with gel pens, I am starting to take over the main floor too.